2017 Mustang GT goes on a wild ride from the skyscrapers of NYC to the untamed ponies of Chincoteague. 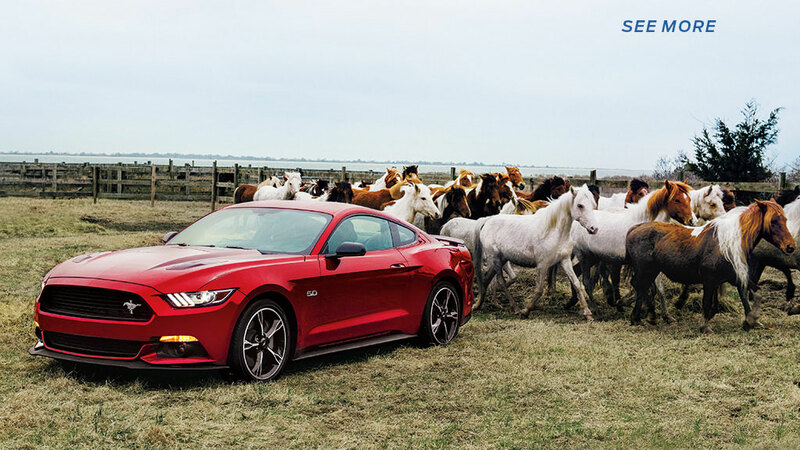 The sound of whinnying and stomping hooves greets us as we pull our 2017 Mustang GT up to the corral on Assateague Island, which is part of Virginia’s Chincoteague National Wildlife Refuge. 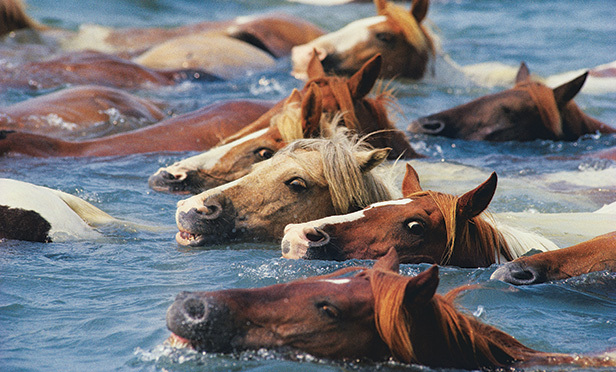 It’s misty outside, which seems quite fitting, because this area is known to many as the setting for the beloved book Misty of Chincoteague, about two kids trying to buy a wild pony at nearby Chincoteague Island’s annual Pony Swim and Auction. The novel may be fiction, but the auction, and the events surrounding it, are real: In the corral, 120 or so untamed horses cavort. These sleek, powerful animals are to be checked by a veterinarian in preparation for the auction, which will take place on July 28 this year. “You made it just in time!” says Roe Terry, a “saltwater cowboy” and a member of the committee in charge of the auction. “Rain’s coming.” Dark clouds roil above us. When we started out in NYC that morning, just before dawn, we thought we were heading out on the ultimate beach road trip that would culminate here, with ponies gamboling in the warm sun and sand. Instead the skies opened and drenched us just about every step of the way. Fortunately the mighty 2017 Mustang GT—with all-weather handling and 435-hp* engine—more than made up for the sogginess. Experiencing a car like this will make you never want to drive anything else. It’ll spoil you for life. As Manhattan’s colossal One World Trade Center recedes in the Mustang’s rearview mirror, the car’s hands-free available SYNC® 3 with Navigation System** seamlessly directs us. We rev the engine and head south down the Garden State Parkway, hugging the shore. Asbury Park is merely an hour away from New York City, but with its retro boardwalk and clean, sandy beach it feels like a different world. Or maybe that has more to do with the eerie fog that envelops us as we pull up to the historic red-brick convention hall. Down the street, the iconic Stone Pony almost shimmers, like an apparition. We walk over and peer in the windows. The Stone Pony music venue is a must-see stop here, of course, because New Jersey native Bruce Springsteen put it on the map. “The Stone Pony is one of those places that has a special meaning for a lot of people,” its general manager, Caroline O’Toole, later tells me. And, judging from the big names on its marquee, the place is not just stuck in the past. “In the last few years The Stone Pony Summer Stage has become a huge attraction on the Jersey Shore,” says O’Toole. After a pea-soupy stroll on the boardwalk, we grab some coffee and delicious oatmeal at hip Cafe Volan, then jump back into the car. 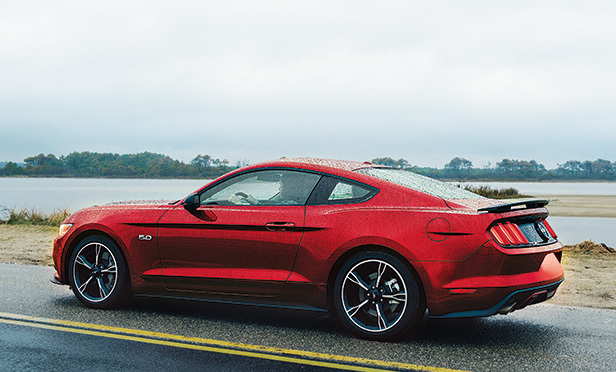 As raindrops splatter the windshield, we flip a switch to activate the Mustang GT’s genius Snow/Wet drive mode and hit the road with enhanced handling and traction. Roar. Dr. Joseph Salvatore, M.D., loves rainy days. He’s the founder and chairman of the Naval Air Station Wildwood Aviation Museum in Lower Township, a suburb of the beautiful seaside town of Cape May, N.J. When the weather is crummy, families flock to this hangar to see his awe-inspiring exhibits and collection of WWII aircraft. “Our slogan is: ‘After the beach and the boardwalk, the rest is history!’” Dr. Salvatore says with a laugh. He shows us around the hangar, where naval cadets were taught to be dive bombers during World War II. Visitors are permitted to climb aboard select vintage planes, try out a Morse code machine, play with a vintage flight simulator, look out from a restored air-control tower and more. “We have something for every age group,” Dr. Salvatore says, as a woman strolls by carrying a dog in her arms. Yes, even pets are allowed here. We wish we could linger longer (who knew that a Nazi submarine once surrendered in New Jersey? ), but we have a ferry to catch. On the way, we slow down to ogle the vibrant Victorian houses dotting the seashore, harking back to the glory days of Cape May, the nation’s oldest seashore resort. Then we drive the ferocious Mustang GT directly into the belly of a boat. A strange thing happens during our 85-minute ferry ride to Lewes: The sun comes out. As waves lick the sides of the ship, a warm breeze caresses our faces. Beach weather! On the Delaware shore, we eagerly drive the Mustang GT off the ferry and down a curvy coastal road. We feel a rush of adrenaline when we hear the powerful roar of the exhaust. Almost immediately, a lightning bolt flashes and rain pours down. But no worries—this is the perfect setting for seafood. And we happen to be approaching Crab Alley, home of “the biggest crabs and freshest seafood in Ocean City,” according to its website. Inside, we order up a smorgasbord, with whole blue crabs, insanely large crab legs, fish tacos and more dishes made from tasty creatures that were hanging out in the ocean just a day or two ago. The manager kindly shows us how to break open a crab with a mallet and a knife. “We call this stuff ‘mustard.’ Some people like to eat it,” he says, pointing to some brownish yellow goop under the shell. We stay away from the mustard. But the rest of the feast is scrumptious. When asked what it’s like to live in an area where horses run free and ocean waves constantly beckon, Terry smiles and says, “It’s heaven. Chincoteague is it.” He is 63 years old, with a wild gray beard, playful eyes and a local “Shinkateeg” twang. Unfortunately, heaven is a bit stormy. As Terry has predicted, we get soaked soon after we arrive at the corral, about 50 miles south of Ocean City. Time to get some sleep. The next day, the Mustang GT effortlessly zips along the wondrous, expansive bridge that leads to the Chincoteague National Wildlife Refuge. The landscape is so dramatic, we are unfazed by the drizzle. The horses are still frolicking when we hop in the Mustang GT to head back north. A ray of light suddenly glints off its Ruby Red hood. With a touch of the accelerator, the vehicle bursts to life, and the tremendous engine sounds like it’s harnessing all the power in the universe. Here comes the sun.